A Maryland couple whose house was on the market about two years with no takers decided to try an unconventional route -- they held a raffle, with their home as top prize. And it worked -- and then some! Starting in January, organizers sold 6,289 tickets at $100 a pop in 78 days, with buyers in every state, and even Puerto Rico, Japan and Iraq. It got Karen Crawford and husband Dennis Kelly what they wanted for their four bedroom, 2,700 square foot farmhouse on four acres near Big Pool Md. -- with $225,000 to spare, which they are donating to the San Mar Children's Home in Boonsboro, Md. The home was appraised art $390,000 when the house was first listed. 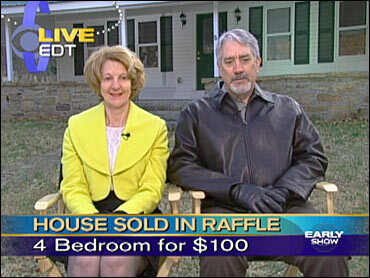 Despite the sales far and wide, the raffle's winner was Dennis Weaver, of nearby Hagerstown, Md. He's a clerk for the Washington County Circuit Court, and says he's not sure he'll even keep the house -- it would lengthen his commute -- he just bought the ticket to help the charity. Weaver would owe about $150,000 in taxes on the value of his prize, accountants say, which he could cover with a home equity loan or by selling his winning ticket. Realtor Cynthia Moler, who orchestrated the deal, says people are lining up to buy it. Crawford told The Early Show co-anchor Harry Smith Monday she and her husband got the raffle idea after reading about an Ohio couple holding an essay contest to sell their farm. She added that the raffle got a super boost when CNN did a story on it on -- Super Bowl Sunday! "It's a huge releif to get out so well and benefit the charity," she remarked to Smith. "That makes me worried!" Weaver joked.